I love the Chicago Cubs, Wrigley Field, and value my game day experience. I also am politically aware and invested with opinions and beliefs just like most people. But Wrigley Field on a game day is not an appropriate venue for political demonstrations. 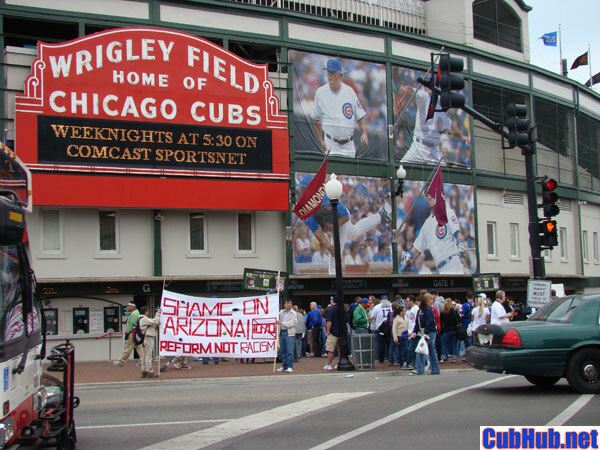 With the opening of the Cubs versus Arizona Diamondbacks series this week, protestors chose Wrigley Field to voice their opionions on a new immigration law in Arizona. I recognize the concept of free speech as a necessary American liberty and right. And I recognize protestors want to reach a large audience with their message. 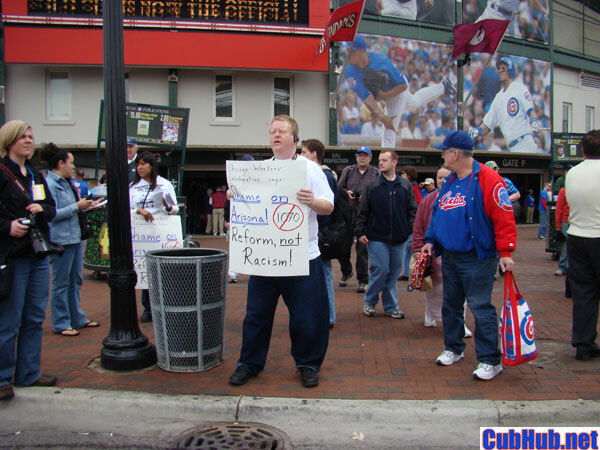 But honestly, I was offended there was a political demonstration in front of Wrigley Field on a game day. I think this choice of venue is really unfair and unfortunate for both fans and Cubs management alike. The demonstration was actually very small, with the television satellite trucks and photographers outnumbering the demonstration participants. In fact the strong police presence was also greater than the demonstration itself. My political beliefs make me very suspicious of this new law in Arizona. But my opinion one way or another on the subject of the protest has nothing to do with my request to keep your politics off my game day experience! Amen to that. Whether you are conservative or progressive, wouldn’t it be great to leave it all behind for awhile and just enjoy a ballgame with other people minus the labels?